After returning from Hokkaido, I had a free day in Tokyo. This was mainly to allow a bit of leeway in case there were any problems with the return flight from Hokkaido. 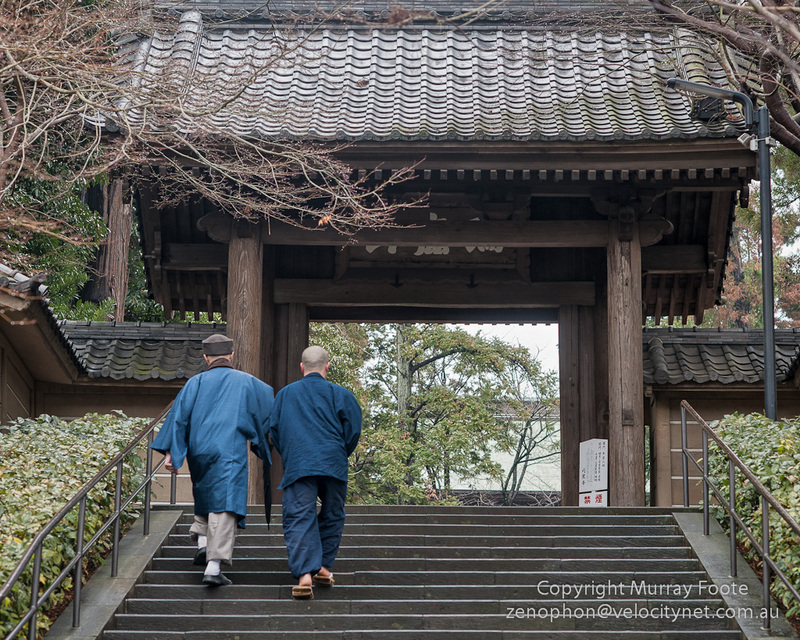 Rather than spending it in Tokyo, though, I elected to take a short train trip south to Kamakura, the administrative capital of Japan from 1192 to 1333. Brian, who was along on the Hokkaido tour, came with me. 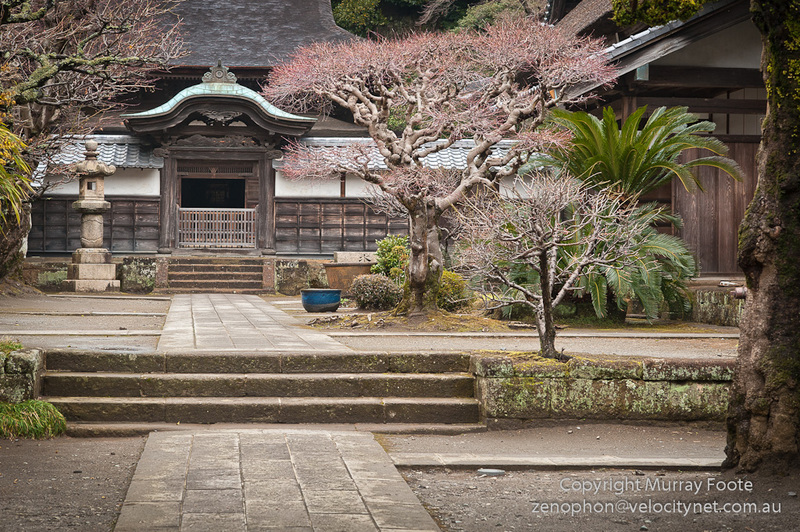 First stop was Engaku-Ji, a Zen Buddhist temple very close to the Kitakamakura railway station. The temple was founded in 1282 to salve the souls of those lost during the wars against the Mongols, both Mongols and Japanese. The Mongols under Kublai Khan attempted to invade in 1274 and in 1281. In both times, they attempted a landing in Kyushu, close to Korea. The first time, they were initially successful in a land battle but withdrew to their ships when the weather worsened and most of the ships were then lost in a typhoon. The second time, they appeared in even greater numbers but the shore they were attacking had been fortified and they were thrown back. Then another typhoon arose and sunk most of the Mongol fleet. This was made worse because they had tried to economise and most of their fleet were river boats rather than ocean-going ships. As well as representing a fortuitous salvation for the Japanese, this was the high point of Kublai Khan’s territorial ambitions. (Typhoon = kamikaze = divine wind). 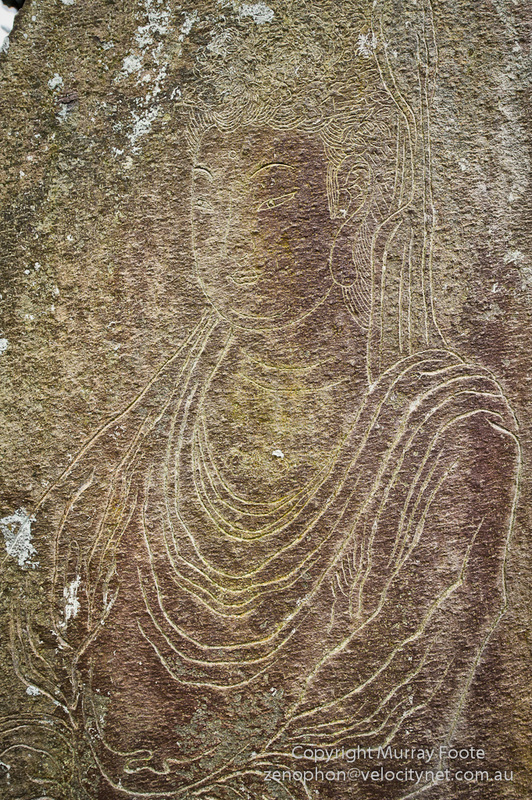 The Buddha (or is it a Boatsu? 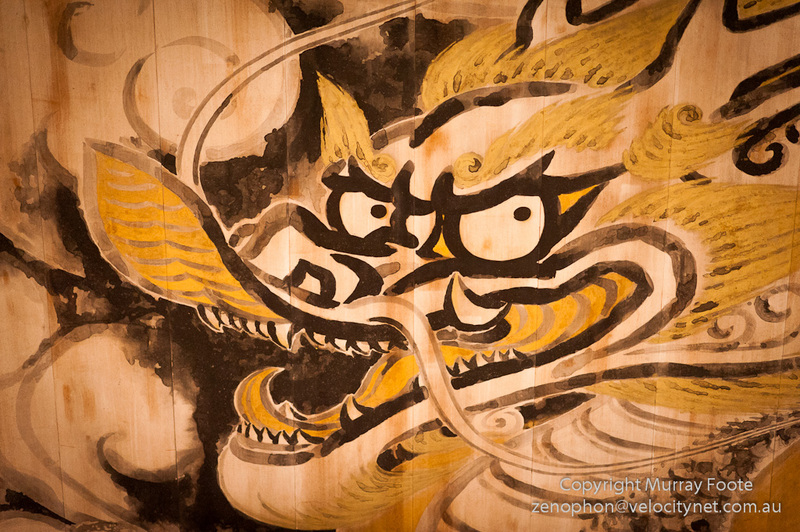 ), Boatsu and Dragon above are in the Butsuden or Main Hall. The head part of the Boatsu is original, dating from the early 14th century; lower parts were restored in 1625. The Boatsu itself is 2.6 metres high, seated. 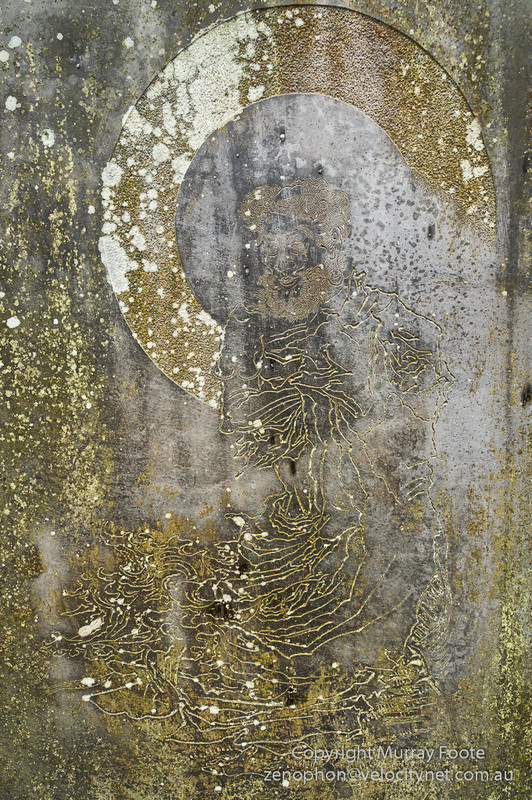 Much of the gold leaf is gone but it is not deemed appropriate to restore it. The dragon is on the ceiling, painted in the early 20th century. 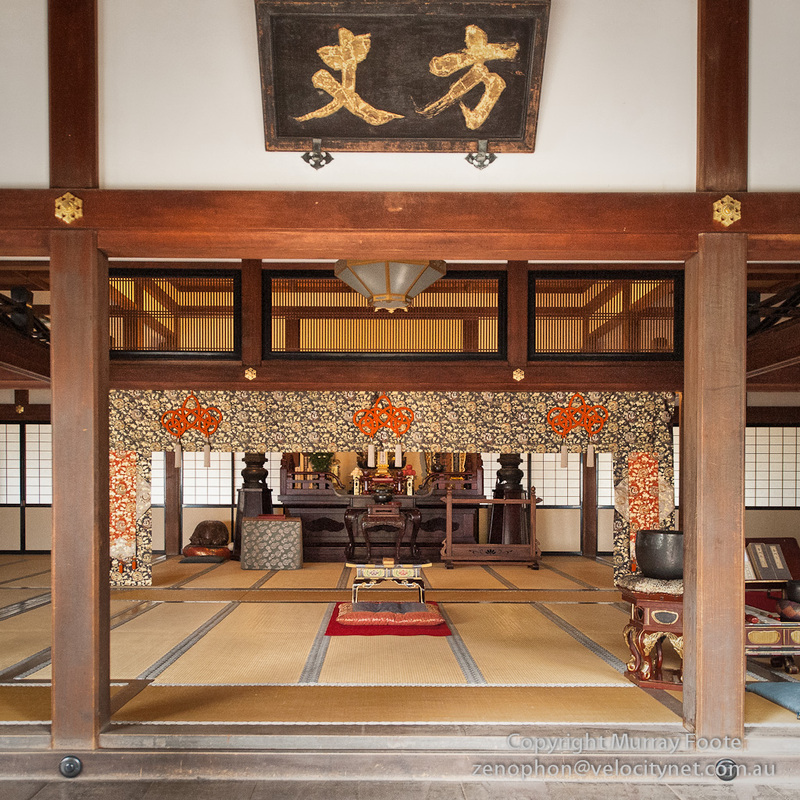 The building itself was recreated to the original design after the previous one became severely damaged in the Great Kanto Earthquake of 1923. 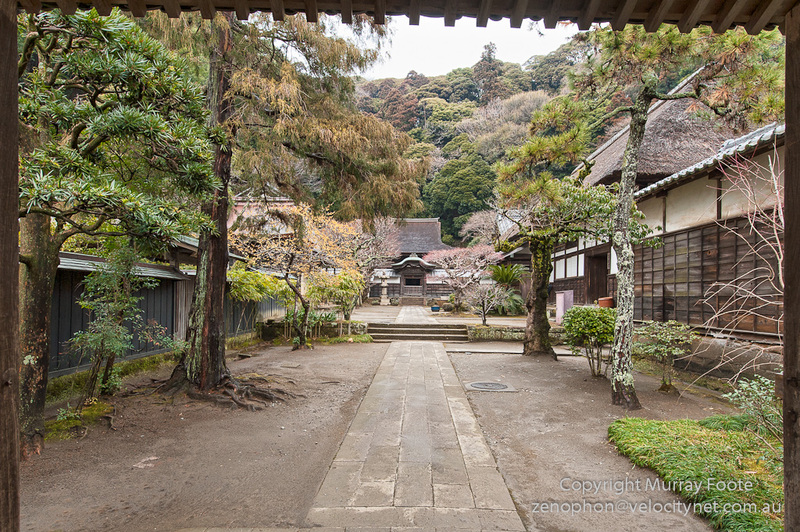 Most of the complex has been rebuilt at one time or another after damage from fire or earthquake. 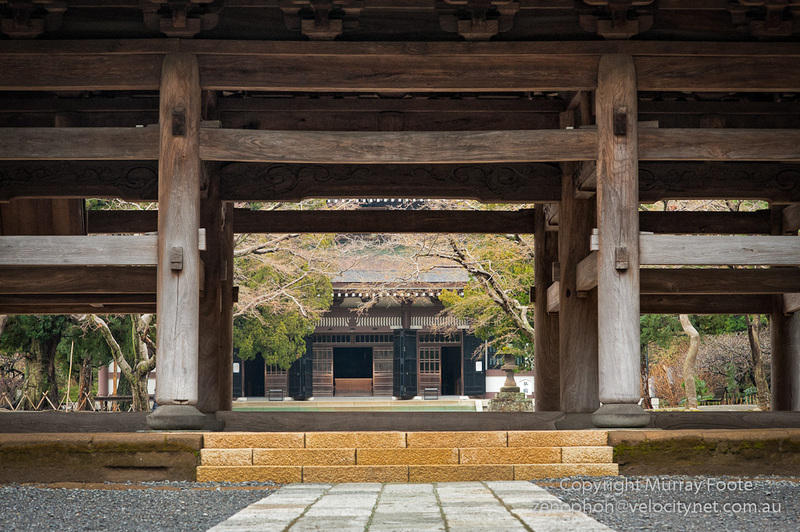 The Sanmon was rebuilt in 1783 to commemorate the 500th anniversary of the death of the founding priest Mugaku-Sogen. 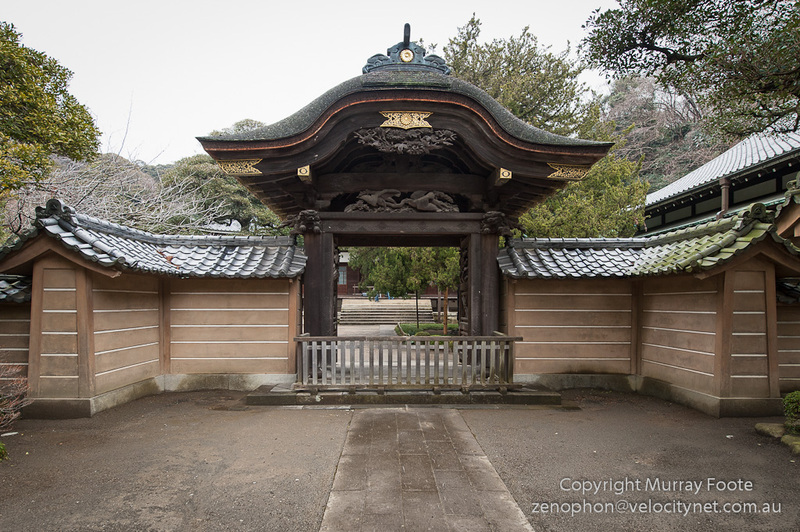 The gateway just above is a side entrance to the Dai-Hojo or Living Quarters for the Chief Priest. 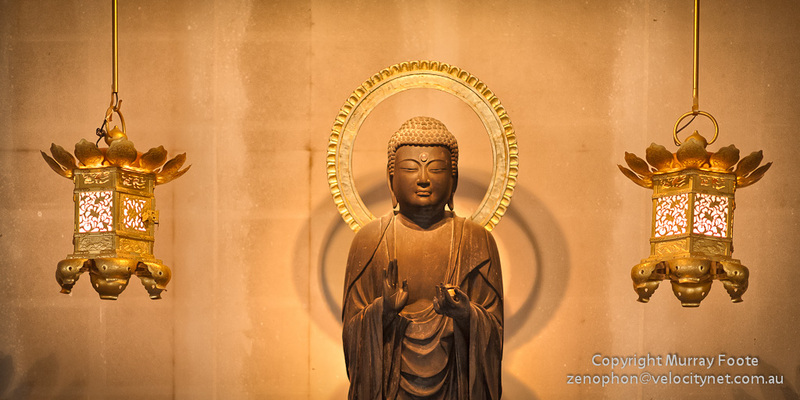 There are many statues and engravings of Kannon, the Goddess of Mercy, in the courtyard of the Dai-Hojo. Any of the images will look better if you click on them to see them larger on a dark background but that particularly applies to the two engravings above. 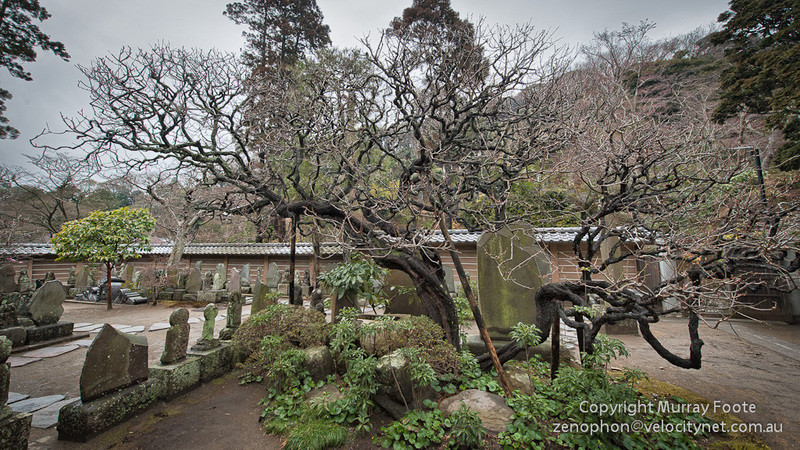 The tree is in the courtyard beside the Kannon statues. If I had been able dial in the weather, I would have had the tree in heavy fog and either covered in snow (unlikely here) or in spring or autumn. 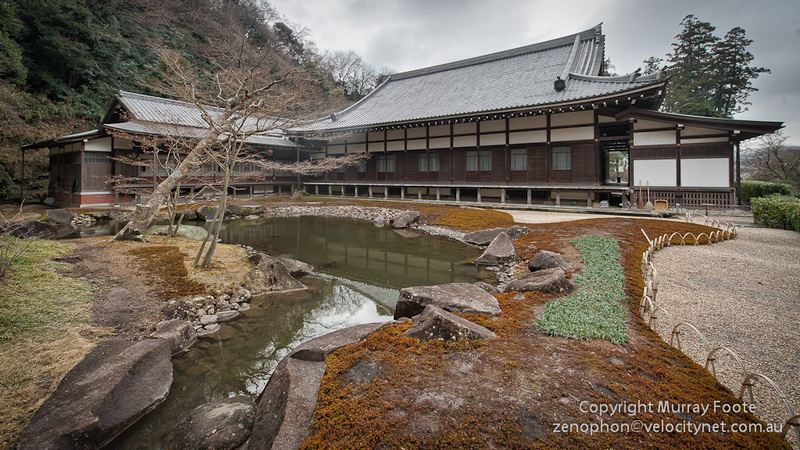 Myokochi means Pond of Sacred Fragrance. It was designed by the founding priest though remodeled in 2001 and probably quite different from the original. The building behind is the actual residence of the current Chief Priest. This is the entrance to Shariden, the centrepiece of the entire Temple. 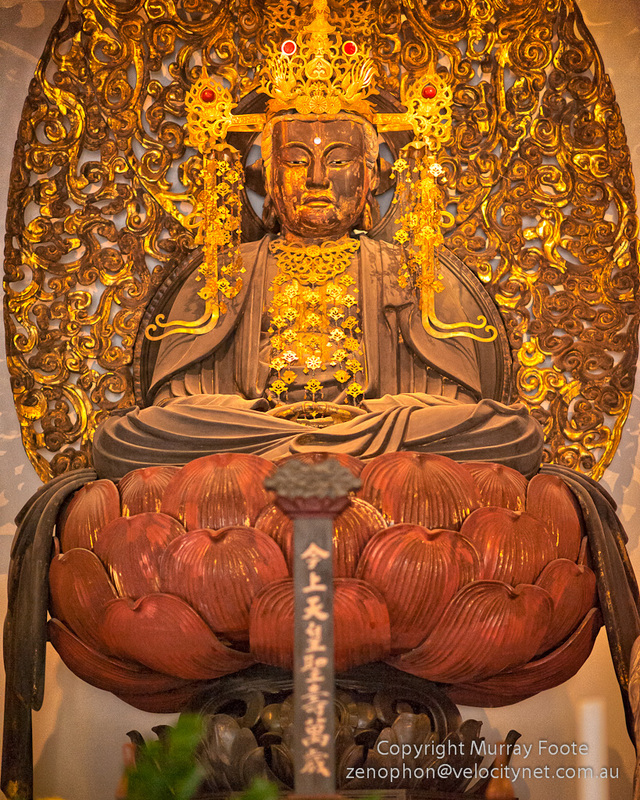 It is the oldest building in the Temple and the only building in the Temple designated as a National Treasure, partly as the oldest Chinese-style building in Japan. Limited access is available on two days each year only. The original building, which no longer exists, was built in 1285 but destroyed by fire in 1563. This building was built in the early 15th century as the main hall of a nunnery but fell into decay after the Head Nun was abducted by local warlords in a battle in 1556. Some decades later, the Temple itself took over the building and restored it. 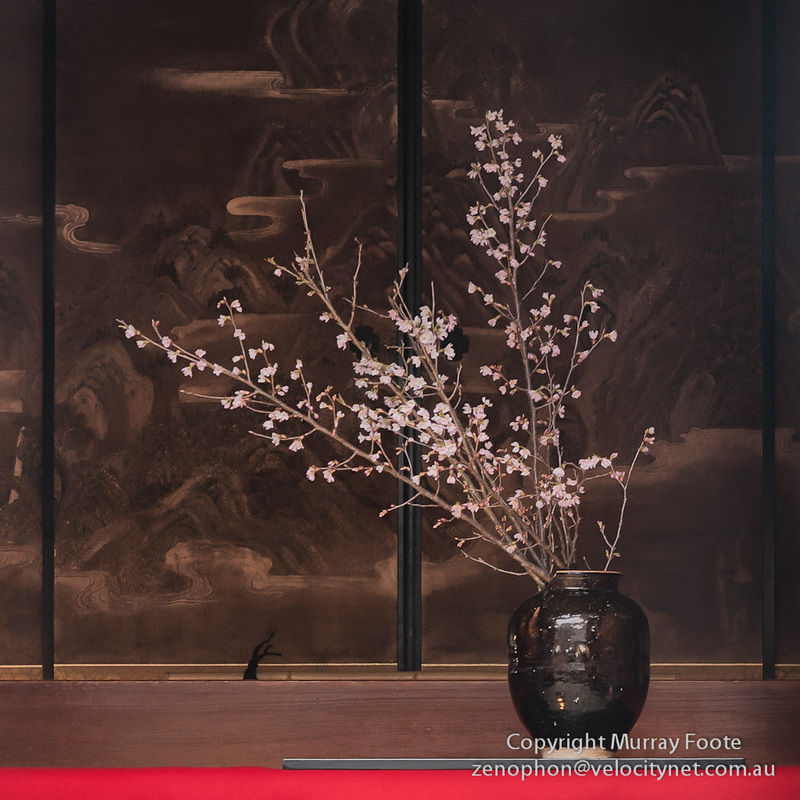 The blossoms and mural are in the entrance hall of a sub-temple, further on from Shariden. This view was only available from a distance. I know where the building is but can’t tell you of its name or its history. There are seventeen subtemples in the complex and there have been as many as forty-two. 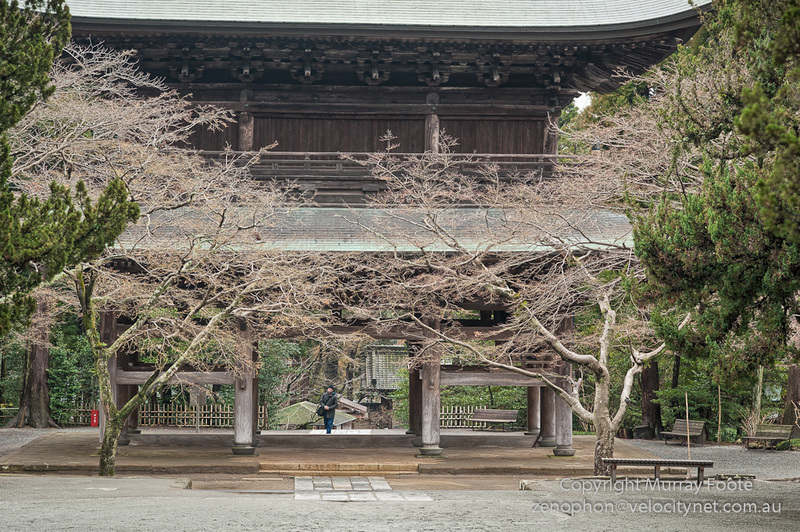 This entry was posted in Japan, Kamakura and tagged Buddhism, Engaku-ji, History, Japan, Kamakura, Photography, Travel, Zen. ← Update – Easter Island: A Parable for Our Times?